It’s a whole new chapter for Amelia Bedelia! Amelia Bedelia makes her chapter book debut! 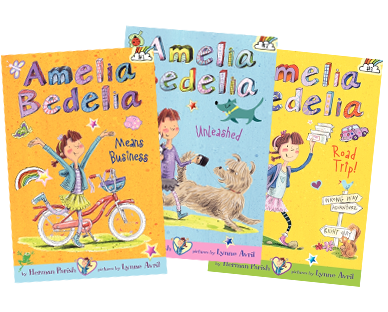 In the new Amelia Bedelia chapter book series, Amelia Bedelia tries to earn money for a new bike, searches for the perfect puppy, goes on a road trip, makes new friends, and has even more mixed-up adventures. With Amelia Bedelia, anything can happen―and it usually does! Did you wish Amelia Bedelia a happy 50th birthday? Celebrate 50 years of Amelia Bedelia in this retrospective video featuring the authors, illustrators, and everyone’s favorite dressed chicken. Join the Amelia Bedelia Facebook community and don’t forget to follow @AmeliaBedelia on Twitter.